News from Google tends to make waves. Its latest announcement is no exception. Google recently unveiled a new Search Console with expanded features and reports, and I’m offering a full review of the new features below. News of the new search console first began to spread back in August, when Google announced its rollout of a beta version of the new console to a select number of users. On January 8, Google again released an announcement. This time, to tell us that soon everyone will be able to take part in the fun. After months of testing, Google is releasing four of the most popular features of the new console to the public. So what will you find in the new Console? Four new, in-depth reports based on 16 months of website data. If you’ve used Search Analytics, the new and improved Search Performance should sound familiar. The Search Performance feature builds on the former by including more in-depth data about how your site performs in search results, such as how often your site appears, its average position, click through rate, etc. The new report shows 16 months worth of data, enabling you to see a much longer range of information and identify any year to year trends or differences. 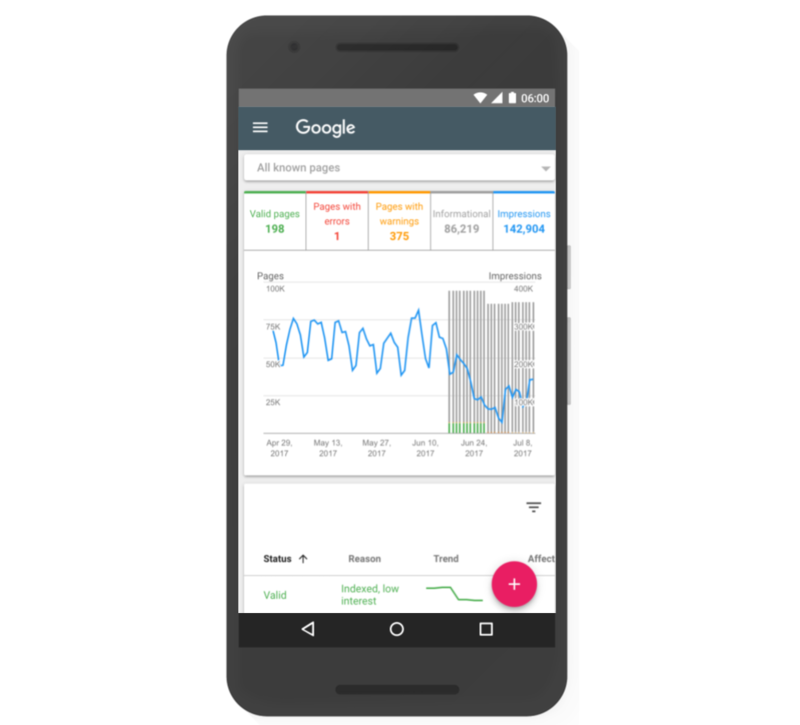 The existing search console already offers a limited index report, but the new version offers much more in-depth information and data. The index report shows you which of your pages have been correctly indexed and identify any potential issues with pages that couldn’t be indexed. Now, the system will automatically alert you when there’s an indexing error and help you get to the bottom of it. When you’re alerted to a specific problem, you will be able given the page details and a link to diagnostic tools to better understand what went wrong. Because these errors often require a specific skill-set to fix, the updated index report also includes a share button so you can easily share the report with members of your team. Once you’ve worked to resolve the issue, you can alert Google. Google will then act faster to recrawl and index your site to make sure your fixes were effective. Going forward, there are a few scenarios to be on the lookout for. First, if you notice a sudden spike in indexing errors, it could point to a change in your template or a sitemap that includes blocked URLs. If you see a drop in indexed pages that isn’t due to errors, it could potentially mean that you’re blocking access to your pages. And lastly, if you see a significant amount of pages that aren’t being indexed, you should look into your excluded URLs to make sure you haven’t excluded any that you want indexed. Google’s been big on accelerated mobile pages (AMP) for a while now, so it makes sense that it now has its own dedicated feature on the new search console. The new console allows you to monitor your AMP performance, including how your pages are displayed and details on any specific error or warnings. Similar to the index report, you’ll be shown all issues found by Google and given insight into which pages were affected, how to fix it, and how to notify Google once the issue has been addressed. 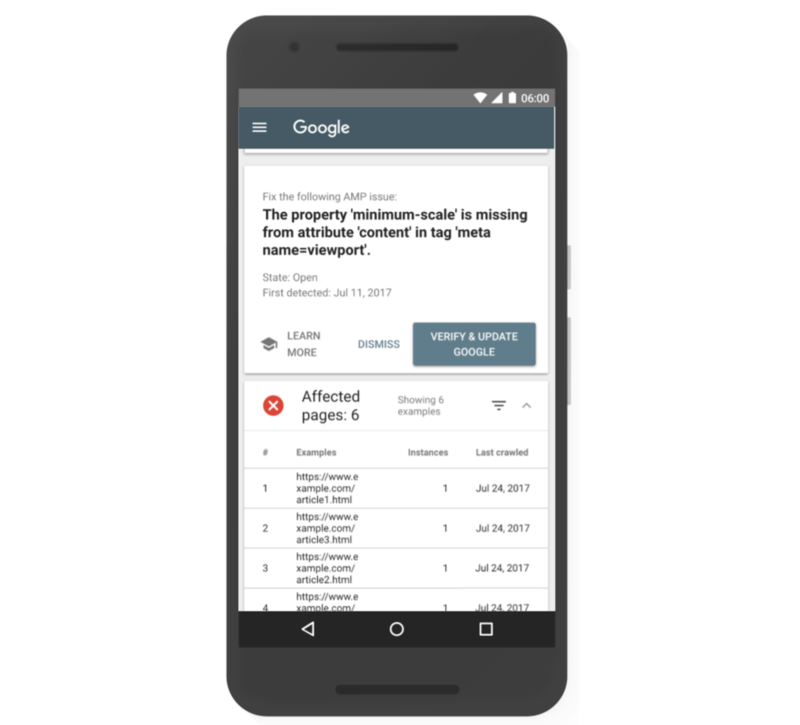 Google will sort all issues by a combination of severity, validation and number of affected pages, with the most pressing listed first. They also note that while AMP pages with warnings can still show in Google search results, they may not appear with all AMP features. Have job openings? Google now has a place for them. Google for Jobs – the company’s answer to sites like Monster and Glassdoor – was announced by the company last year and available only in certain locations. Now, you’ll be able to list your job openings through the search console and monitor their performance. The report will tell you any potential errors in your postings, and you will be able to monitor any error spikes or missing job postings. Similar to its other report functions, you will be able to alert Google that your postings are ready to be revalidated once the errors have been fixed. What Does Google’s Search Console Mean for Business? The newest installment is an obvious upgrade for marketers. Perhaps the biggest improvement is the transparency offered in the new reports. While much of this data has been limited in the past, webmasters will now have access to detailed reports and error messages regarding indexing and search performance. A less emphasized but no less important upgrade is the ease of communication the new reports allow between team members. A simple share button will allow for clearer communication and faster fixes. As the new console continues to roll out and Google adds more features from the old console, the old version will stay live. For now, Google states that both versions will continue to live side by side and webmasters will be able to access both through the navigation bar. As for the future, Google’s isn’t stopping with these four features. Google plans to roll out more features throughout the year. The new Search Console represents a big step towards transparency with Google, and as any SEO knows, that’s a step in the right direction. Time will tell how these changes affect campaigns going forward, but for now, stay tuned. There’s more to come. 1. What Is the Difference Between Google Search Console Users and Owners? Google Search Console users and owners have different authority levels. Users can see all data and take some actions. However, they can’t add new users. There’s a class of restricted users as well. They can view most of the data but can’t take any actions. Owners, on the other hand, have complete control. They can change settings, access every tool, add new users, and remove existing users. Verified owners – They’ve completed the website property verification process. Delegated owners – Owners who’ve been added by the verified owner. 2. How Do I Use Google Search Console to Identify My Highest-Traffic Queries? Log in to Google Search Console. Click on Performance on the left-hand sidebar. Click the QUERIES tab in the middle of the screen. Click on Date towards the top of the page. It’s probably defaulted to “Last 3 months.” Enter whatever date range you want. Make sure that Total Clicks is selected. You can deselect Total impressions if you’re only interested in search traffic. Click the down arrow next to Clicks on the table to sort your results in descending order of the number of clicks. 3. How Do I Use Google Search Console to Compare My Site’s Search Performance Across Different Devices? Click on the DEVICES tab in the middle of the screen. Towards the top of the screen, make sure that Total clicks, Total impressions, Average CTR, and Average position are all selected. The table in the middle shows your performance for different devices. Each device has its own row.